This unique venue offers live music, film previews, brunch, dinner, wine/dinner events, comedy events and more. There’s valet parking but we found plenty on the street. I’ll be back due to the astonishing spaciousness, the classy ambiance, excellent service, the entertainment factor and of course, the exceptional wine choices. In compliance of full disclosure, I can certifiably say that I am a ‘wine snob.’ It’s actually one of the few labels I don’t mind when referring to myself, as I truly live by the adage, ‘Life is too short to drink cheap wine.’ With that being said, the wine was not over-the-top expensive either; it’s priced somewhere in the middle, but remember you’re also paying for the upscale ambience. Having frequented many small, dimly lit ‘wine bars’ over the years, City Winery bears resemblance to none of those. It’s a beautifully well-planned space with two mega areas, one with a second story level, and a grand entrance. There’s also a humongous outdoor courtyard, adjacent to the restaurant that’s calling my name come spring! City Winery Chicago opened in August of 2012, and is the expansion of City Winery New York, with Chicagoans as the lucky benefactors. 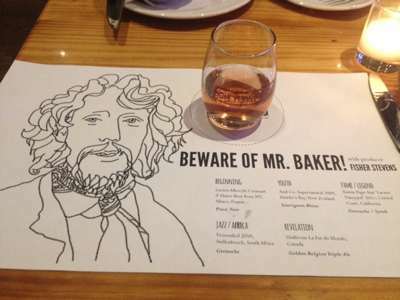 We attended ‘A Film Preview/Wine Pairing Event,’ hosted by filmmaker and producer Fisher Stevens, who was promoting the film, “Beware of Mr. Baker.” It’s a documentary of the legendary drummer Ginger Baker of the band, Cream. Perfect for me, as I’ve been a member of the Chicago Film Critics Association for the past five years and I was lucky enough to see Ginger Baker live in Madison Square Gardens (2005) for his last performance with Cream. The event started at 8pm and when the doors opened at 6pm you are notified that seating is first come first serve. Samantha, our waitress, was pleasant and helpful. The menu is mainly small plates, but they do offer large portion dinners. Yum/Taste Factor − Details of the beverages and food we tried. Pinot Noir-Three Vineyard Blend, Full-bodied, deep red color. Notes of cherry and vanilla, on the fuller side of Pinot Noir’s. Very nice. $12 per glass.